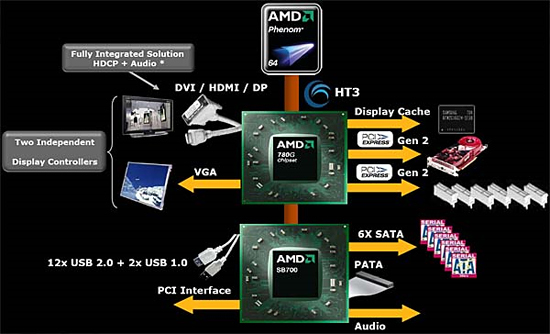 AMD's SB750: Enabling Higher Phenom Overclocks? The web has been alive with rumors of an upcoming update to AMD's 7-series chipsets that will somehow unlock the true overclocking potential of its Phenom processors. The rumor goes something like this: an updated South Bridge (SB750) will improve communication with Phenom, removing a previous bottleneck and improving the maximum overclock possible. We can't begin to explain the many issues with the various rumors, but we have to allow that somewhere buried deep in these rumors there is a morsel of truth. The AMD 780G chipset, the South Bridge is the chip, er, at the south end of the image. USB, SATA and Audio all stem off of this chip. The South Bridge of a chipset is typically responsible for I/O operations. The non-critical PCIe lanes come off of this chip, as do the SATA and USB ports. Audio codecs, networking interfaces and virtually all other components are also run off the South Bridge. The North Bridge on the other hand talks directly to the CPU and connects it to much higher speed elements of the system; things like graphics cards and main memory all stem from the typical North Bridge design. The point of this explanation being that if anything were going to improve overclocking performance, we would assume it would be the North Bridge, not the SB. However, AMD has taken a different approach from traditional chipset engineering as we will soon see. Foxconn sent us their new A79A-S motherboard that is part of their Digital Life series of products. 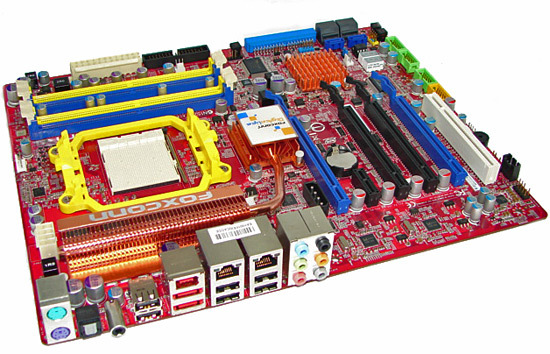 This motherboard was not designed to be an extreme overclocker, but instead a feature rich platform that offers the capability to overclock when required. In testing to date, the board has actually gained a reputation of being an excellent overclocker along with a full featured BIOS. While the BIOS options are not as extensive as the top end 790FX products from ASUS or DFI, there are more than enough options to ensure successful overclocking for the vast majority of users. Foxconn is still developing the BIOS and we have sent our feedback on a few areas we would like to see improved, but overall, this board gets a recommendation from us. We will take an additional look at the board during the official 790FX/SB750 launch activities next week but here are a few major features. The A79A-S includes four x16 PCIe 2.0 slots (dual x16 or quad x8 electrical), one PCIe x1 and one PCI slots, six native SATA II ports featuring RAID 0, 1, 5, or 10 support, two dual e-SATA ports, dual Gigabit LAN ports, Realtek ALC888 HD audio featuring DTS Connect and Dolby Digital Live support, 12 USB 2.0 connections, dual IEEE-1394a connections, LED Debug display, and on/Off/CMOS buttons. Let's take a look at how all of this works, at least what we know works. This article claims the PCIe slots are 1.x when they are in fact 2.0 as stated in the manual, website and other sources. "it's unclear whether or not whatever AMD is doing here can even work on K8 if they tried." Nope. I've been waiting for a board/BIOS maker to expose this chipset setting since the Athlon XP Mobile Barton CPUs first made me aware of it. My Mobile Barton Athlon XP was basically a completely unlocked bin-sorted Athlon XP 3200+ that was stable at lower voltages expected to be run at much-lower voltages and clock speeds. With it, I discovered that there was clearly a chipset setting not exposed when my Mobile Barton failed to reach 200/400FSB in an nForce2 Ultra400 board (the Shuttle board inside my SN45G XPC... the FN45-whatever IIRC) while the same CPU could easily do 450+FSB in an Asus A7N8X-E Deluxe and an Abit NF7-S. The solution? Drop a thin wire inside the socket to make this completely unlocked CPU *DEFAULT* to 400FSB and it runs perfectly fine and can even go higher (the L12 trick/mod). With the default FSB being the only difference (all settings/frequencies, including the FSB, were the same), it was very clear that it was related to a calibration setting that was automatically applied by the chipset based on the default FSB (100MHZ/200FSB for this unlocked CPU). Previously, I could only get to 333FSB before Memtest 86+ would start giving errors. There were some reports of even the overclocking boards (mentioned earlier) getting higher with the L12 trick and later many had BIOS updates and board revisions that seemingly integrated the trick. Regardless, the setting was still not exposed and was likely not even something the board/BIOS makers could expose (though they could spoof the default FSB I'd assume). It looks like AMD, having full control of chipset and board-level options here, has finally let the cat out of the bag. | a zero fiscal gain. No, this looks extremely calculated, it's like they knew someone would probably go tearing it apart eventually and so tried to scatter landmines out so as to where you'd probably hit one eventually. I've never had much faith in Windows OC tools. However if this one actually works and AMD can up their speeds a little then I may switch back for my next system. I must say my 6400-8400(cheated got an e3110 with 20% discount when first released and they were all $280 or OOS for $170). Upgrade path was seamless and I feel bad going from 1950Pro to 8800GT 512 but I follow my wallet not the company I root for. Will a 3.1Ghz ultraoverclocked quad core Phenom beat a $80 E2180@3,1Ghz in gaming and common day tasks? So does this ACC on the SB750 do anything for vanilla Phenom's? Will it unlock the multiplier on the non-black Phenoms or just make them more stable with the HT and memory over clocks? First, you can't unlock the multiplier on the non Black Edition Phenoms. They are locked at the factory during manufacturing and can not be altered. Sounds like there will be an advantage still to having the SB750 with Vanilla Phenoms.